MOSCOW, January 12. /TASS/. The Russian military has wiped out a subversive militant group, which shelled the Hmeymim airbase in Syria with mortars on December 31, the Russian Defense Ministry reported on Friday. According to the ministry, a special operation was held to spot and eliminate it. A group of Russian Special Operation Forces established the militants' location close to the western border of the Idlib province. "When the terrorists arrived at the facility where they were to board a minibus, the whole subversive group was eliminated by the Krasnopol high-precision munition," the ministry said. The Russian Defense Ministry added that all manpower and materiel of Russia’s multilevel military intelligence system in Syria had been involved in the operation. Earlier reports said that a subversive militant group had shelled Hmeymim airbase on December 31, 2017, killing two Russian military servicemen. Russia’s Krasnopol precision artillery munition has wiped out terrorists’ drone assembly and storage depot in the Syrian province of Idlib, according to the Defense Ministry. "The Russian military reconnaissance has uncovered a terrorist fixed-wing drone assembly and storage place in the province of Idlib. The depot has been destroyed by the Krasnopol precision artillery munition," the Defense Ministry said. 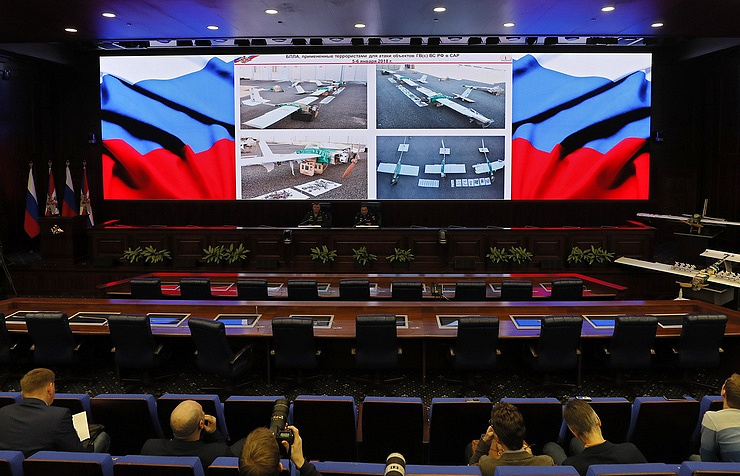 The Russian Defense Ministry earlier reported that on January 6 militants in Syria had massively used UAVs for the first time when attacking Russia’s Hmeymim airbase and the naval supply base in Tartus. The attack was successfully repelled. Seven vehicles were shot down, and six were taken under control with the help of electronic warfare means. The ministry also said the drones that tried to attack Hmeymim and Tartus had been launched from the area of Muazzar, in the southwestern part of the de-escalation zone Idlib, held by the armed groups of the so-called moderate opposition.